Singing Sounds is like licking a quadruple chocolate lollipop secretly filled with important additions---wonderful children’s music! It’s also the result of a careful collaboration between music therapist and singer-songwriter, Cathy Bollinger, a speech pathologist and parents. Because each song emphasizes a specific sound-for example, “Gosh By Golly, I Giggled Again,” “Fee Fi Fo Fum,” and “Leo the Lazy Lion”, this children’s music CD is a tool that helps children develop language skills that are the basic building blocks for reading. Because each song comes from Cathy Bollinger, this CD is a delightful, spirited blast using all manner of musical instrument, including a banjo, a bugle, fife, French horn, a train whistle and… pots and pans! This rollicking collection of songs helps children form correct speech sounds by breaking words down into sounds and syllables, or, in other words, by magically transforming tough letter sounds into snappy sing-a-longs children love. I was looking for some fun and educational songs that we could both enjoy. 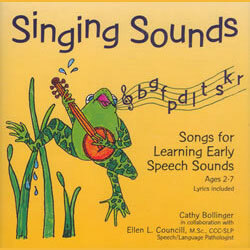 I purchased "Toddlin Tunes", "Alphabet Jam", Singing Words and Singing Sounds. I must tell you I have never found such wonderfully constructed children's music anywhere else. Not only are the songs enjoyable, they are educational in a way that I have never seen before with other children's music. I honestly have never seen such a perfect combination of vocal and instrumental excellence, educational and fun lyrics and such a wonderful variety in the sound of each song... Today we were listening to [one of the songs] when I stopped the car at the grocery store (in mid-song), my son began to cry "mo mo" and made the sign for more. My son hates the car seat and usually squeals with delight at the idea of getting out of the car. He liked the song so much, he didn't want it to stop, even if that meant staying in his car seat. He has also been singing/humming the ABC song at random times throughout the day. I know the CD's have helped him learn more of his alphabet. Not only are they helpful for the kids, but I have found myself in tears on more than one occasion just listening to the tender and sweet lyrics of these wonderful songs... Please keep me updated (if possible) on any new albums or any events (in the Dallas,Texas area) if you are ever down this way. We wouldn't want to miss out. Thank you for sharing your talents with our kids.